A visit to long-lived Cucina Toscana. The last time I visited and wrote about Cucina Toscana—one of Salt Lake City's most steadfast restaurants—impresario Valter Nassi was still holding court as "master of ceremonies," host and all around gadfly. That was many years ago, and some Nassi lovers followed him when he left Toscana and opened his namesake Valter's Osteria. The atmosphere at Cucina Toscana these days is a bit more subdued than during the Nassi years; if you know him, you know what I'm talking about. There is less of a show in the dining room, and the focus is more on the food than the entertainment. I do miss Nassi, but I think the cuisine has become more serious than in the past. Then again, not that much has changed. The kitchen staff has remained largely intact in recent years; there's a consistency that plenty of restauranteurs would envy. The décor hasn't undergone any major overhauls since Nassi's departure, either: black-and-white color scheme, crisp white tablecloths and napkins and tables set with quality stemware. It's a classy place to dine, although that doesn't stop some from coming in flip-flops, cutoffs and baseball caps. On a recent visit, the host who seated us might have been draped in Prada or Armani—I'm not sure of my designers—and I was impressed, since I was wearing a suit myself, when asked if I'd prefer a black or white napkin. My wife had to explain to me that white napkins tend to leave white lint on dark suits, and so the black one was the way to go. I've never even been given the napkin choice in European 3-Star Michelin restaurants, so score one for SLC. Once seated, a server brought us gratis bruschetta with diced tomato and fresh basil, perhaps to prepare us for what was to come. Upon initially perusing the menu, sticker shock might occur. Risotto of the day is $34. A simple antipasto of burrata, roasted tomatoes and saba is priced at $18. The charcuterie and cheese selection is $19, and the fresh fish dish of the day runs $44, so bring your platinum card. I held my breath and ordered a $29 dish from the antipasti selection: aragosta e granchio in carpaccio. It's a lovely looking dish, served on a rectangular white plate. In each of the four corners is a tomato slice topped with chunks of lobster and crab, upon which, in turn, lies a single shrimp. At the center of the plate is a mound of arugula topped with shaved fennel and Parmigiano-Reggiano. It's a pretty straightforward dish, where the crab and lobster do the talking—no fancy foams, reductions or sauces to muck up the works. Would I eat it again? Yes. Would I order it again? Not at that price. A better bang-for-the-buck, I think, is carpaccio di bue ($20), which is thin-sliced Piedmontese beef carpaccio simply dressed with arugula, olive oil, lemon juice and Parmigiano-Reggiano. 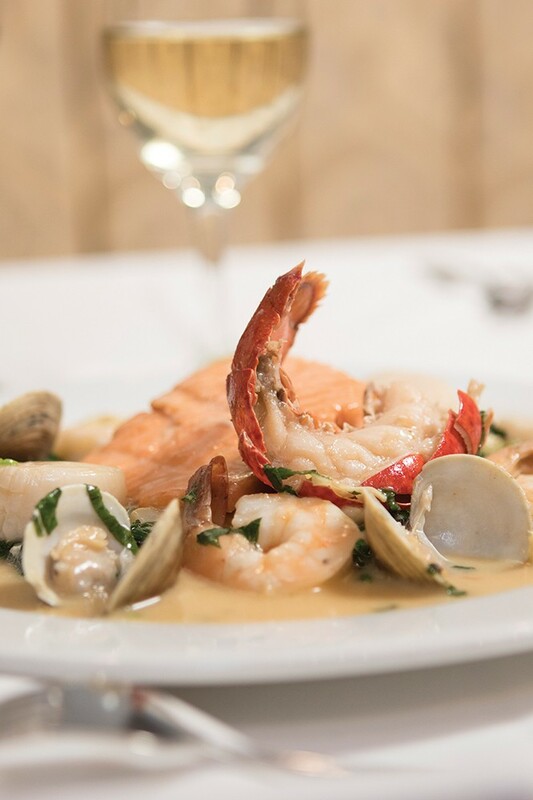 For a warm antipasto dish, there is capesante ($29), which features sautéed shrimp, calamari and scallops with spinach in a shrimp reduction. For many customers, the pasta selection is the reason for returning. I've loved their housemade gnocchi for as long as I can remember, whether it's the no-nonsense pomodoro preparation ($22) or the spicier arrabbiata ($22). The spaghetti alla carbonara ($20) is solid, as are the Bolognese-style lasagna and the housemade ravioli dishes. For seafood lovers looking to go big, it's hard to beat the spaghetti all'ubriaco ($38). This "drunken" spaghetti dish features Chianti-infused shrimp reduction and a seafood assortment of clams, lobster, shrimp, calamari and scallops. A great way to sample some of the excellent pastas without committing to an entire plate of one item is with the pasta primi piatti selection. These are mix-and-match pasta dishes such as potato gnocchi with spicy tomato sauce, together with spinach and ricotta ravioli in butter-sage tomato sauce. With the primi piatti, you get to taste two or three different small-portioned pastas on one plate. I thoroughly enjoyed the Pasta Duo ($15), which was housemade potato gnocchi in spicy tomato sauce on one side of the plate, paired with spinach and ricotta ravioli topped with a rich, decadent, Fontina, Parmesan, gorgonzola and goat cheese cream sauce on the other. Heaven. The secondi piatti portion of the menu is what we typically think of as entrées. Classic Italian fare such as chicken saltimbocca ($28), chicken Marsala ($24) and veal scallopine with lemon and white wine sauce ($32) are offered, along with various pork, duck, fish and beef selections. For something light and lovely, I recommend the vitello Albese ($36), which is tender, thin-sliced veal medallions with oyster mushrooms and white truffle fondue. At the other end of the light-to-heavy scale is ossobuco di bue alla Piemontese ($36). It's an interesting deviation from classic ossobuco, which usually involves lamb or veal shanks. Here, a braised Piedmontese beef short rib is the main attraction. It's cooked until (yes, it's a cliché) nearly falling off the bone. The beef is oh-so tender and tasty, bathed in a natural au jus with chunks of carrots and celery. I'd have preferred more delicate minced vegetables, but that's a minor issue. Our server was kind enough to include a portion of spaghetti with the ossobuco at no extra charge. Where in the past I often found servers to be jittery and sometimes discombobulated, recent experience was quite the opposite: confident, friendly and professional, with excellent timing. Water and wine glasses never went unattended and servers were very much in command of the extensive menu and wine list. I'd say Cucina Toscana is here to stay.